KCTarifa will continue offering on the second Thursday of each month the new trends of the Teatro Andaluz Independiente micro theater. The months of October and November can be enjoyed with a retrospective of the works that have had the most success among the Tarifeño public in previous seasons. 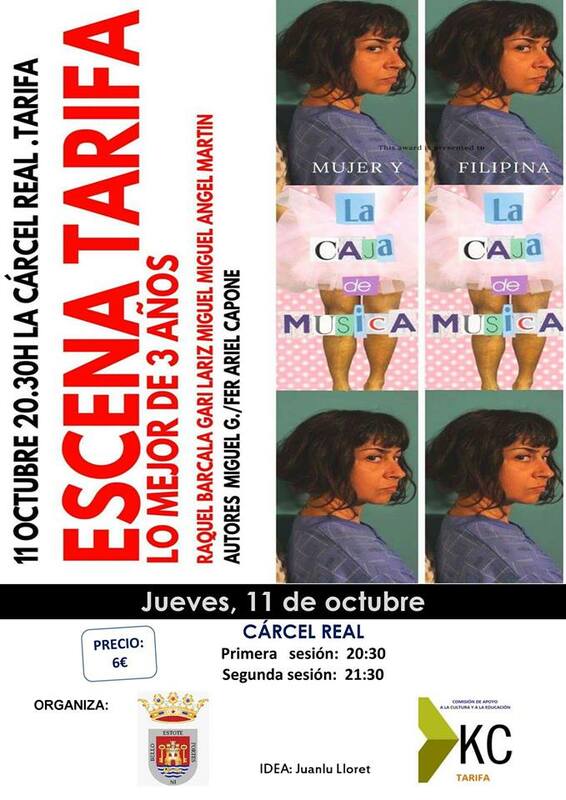 This Thursday 11th in the Royal Prison begins the new season of SCENE TARIFA with two funny comedies “Mujer y Filipina” and “Caja de Música”. “Mujer y Filipina” brings to the stage the story of the fifth anniversary of a couple who watches a cake. Fabiola snoozes with antihistamines while Íñigo does not lose sight of the cake on the table. It seems that a secret will come to light that same day. The author is Fer Ariel and the director Raquel Barcala. The couple in question is dramatized by Gari Lariz and the director herself, Raquel Barcala. And the second work “La Caja de Música” Miguel G. and Miguel A. Martín will show us that sometimes the stones you find along the way do not matter to achieve your goal, if you really want it, you can. A comedy gamberra, a pure theatrical expression that with a shameless language, like its protagonist, gives way to a message of overcoming and tenderness. Hand in hand with the Culture and Education Area of ​​Tarifa, KCTarifa and Juanlu Lloret, the Tarifeño public will have a recommended monthly appointment for their enjoyment and entertainment at a minimum cost, 4 euros per ticket, or a € 6 voucher, with passes to 8:30 p.m. to 9:30 p.m.